James and I spent the day in Boston last Friday to celebrate our 5-year anniversary. When we happened upon a quaint farmer’s market downtown near Copley Place I couldn’t resist a peak. I’m one of those odd breeds of women that would pass up shoe or handbag shopping for a good farmer’s market any day. Needless to say, I was in heaven; nothing beats perusing the booths of a farmer’s market during the months of July and August. One treasure that caught my eye in particular was a beautiful rainbow of multicolored carrots being offered by one of the local farms. I was very tempted to pickup a bunch, but knowing that the next day I would be getting my weekly CSA basket overflowing with more vegetables than James and I could possibly eat in a week, I decided not to. As I walked away I couldn’t help but feel some remorse for not picking up those carrots and tried to reassure myself that I had made the right decision. some green onions, chipotle peppers, and lime juice to balance the sweetness of the fresh carrots, and piled my creation atop a couple of hard-boiled eggs for protein. Slice or tear the green onions into long thin strands. Soak the onion strands in ice water for at least 10 minutes. This will mellow their sharp flavor and give them a pretty curl. Using a vegetable peeler, slice the carrots into long ribbons. Coat the bottom of a large skillet with the olive oil and heat until almost smoking. Add in the carrots and quickly toss to coat all the ribbons in the oil. After just a few seconds, transfer the carrots to a medium bowl. The carrots shouldn’t be on the heat for more than a minute total. Toss the carrots with about a ½ teaspoon of sea salt. Remove the green onions from the ice water bath and pat dry with a towel. In a small bowl whisk together the lime juice, zest, chipotle paste, parsley, and a pinch of salt and black pepper. Add the green onions and lime dressing to the carrots. Toss to coat and season with addition salt to taste. 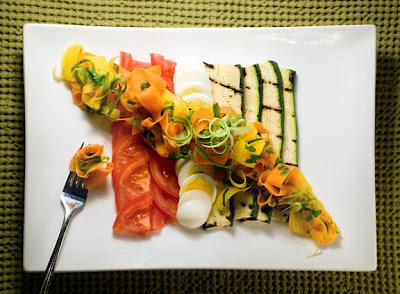 Arrange the hard-boiled egg slices, tomatoes, and zucchini on a plate. Sprinkle with a bit of salt and freshly cracked pepper. Top with a few spoonfuls of the carrot slaw. Enjoy! I realized tonight when I read about your veggie wrap that I missed this posting. This one really made me laugh (passing up the pocket books :-)), but I really liked reading about the carrots. So glad they were in your CSA basket. Too bad there wasn't a Louis Vuitton in there as well ... ha-ha!! !